Everyone wants to be like Eric Clapton or Pete Townshend and play a great guitar but it’s not easy. We admire all kinds of great icons from great melody-driven players like Chuck Berry and George Harrison to more aggressive and technical stars like David Gilmour. Many are influenced by blues sounds from figures like Stevie Ray Vaughan or Billy Gibbons. Others concentrate on deeper and grittier metal sounds from Tony Iommi or Ritchie Blackmore. Some people prefer the sounds of funk-oriented guitarists like John Frusciante or Prince. Many like those who are a little lighter in sound like John Mayer. There are even those who prefer someone a little more experimental like Robert Fripp or Frank Zappa. They can work with guitar sounds in many styles. They can be as hard or soft as they want. There is no real set standard for playing the guitar. Some people can be fast or slow. Others might focus on special effects. Only a few people can produce great guitar songs. 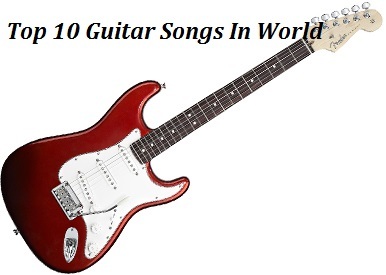 This is a look at some of the best guitar songs ever made. Much of the story of rock and roll begins and ends with the late Chuck Berry. There’s a reason why he is called the King of Rock and Roll. This song of his is a track that exemplifies how well a great riff can work and how intense it can sound when used right. This song especially helped unite black and white audiences together in the early days of rock and roll. There is several songs form the Rolling Stone that illustrate Keith Richards as a true icon but this one is probably the most definitive. Brown Sugar is heralded as a trade with a prominent and distinctive blues vibe that comes with a slight edge to it. This makes for a great song that has been a part of the Stones’ shows to this day. One of the biggest crimes in rock music history is that Derek and the Dominos, Eric Clapton’s follow-up group to Cream, did not last very long. It’s unfortunate as the group was an amazing blues-oriented band. Layla is the most noteworthy song the band made for offering a powerful guitar sound from Clapton. This includes both a strong hard rock-inspired sound at the beginning and a lighter blues-based sound in the second half that fits in with Jim Gordon’s piano. Eddie Van Halen has been admired for being a true icon in the heavy metal guitar world. Eruption remains an iconic instrumental that shows the incredible technical skills that he was known hold. This also introduced how tapping techniques work to create more detailed guitar songs. This flows in perfectly to a cover of the Kinks’ You Really Got Me that shows more of Eddie’s great skills. The Latin-inspired group Santana took this early Fleetwood Mac song and an instrumental from Gabor Szabo and combined them into one memorable track. The powerful high-pitched sounds of Carlos Santana’s guitar really elevate these two tracks as they are paired together. The hammer-ons and slides on his guitar especially stand out. Jimi Hendrix is a truly noteworthy guitarist in history. One of the last songs that he recorded in his life was Machine Gun a twelve-minute song considered to be a protest against the Vietnam War. The song was written as a criticism of the war but the powerful and gripping sounds of his guitar are what make this a favorite. It is especially for being loud and powerful. Jeff Beck was never able to get the same mainstream attention as many of his fellow guitarists from the time but he continues to be admired as a true guitar icon. This song highlights his great guitar style to create an atmosphere song that highlights a great style with some impressive guitar moves all the way around. One of the earliest true guitar jam songs, this track from the Byrds is a beautiful track that incorporated psychedelic influences at the time. The guitars of both Jim McGuinn and David Crosby were heavily inspired by Indian culture and sounds. The beautiful and wide-open sound has inspired many artists over the years. Don McLean name-checked the song in American Pie while the Ventures made a surf-inspired version of the song and Golden Earring had their own nearly twenty-minute version of it. This early Pink Floyd instrumental features a psychedelic series of solos from Syd Barrett on guitar and Roger Waters on bass. The song comes with a very heavily space-inspired sound. It is a truly iconic track in the world of rock music for how improvisational it sounds while still being organized. Unfortunately, Tom Verlaine’s Television was never able to get too far from the New York rock underground but the band has still inspired guitarists to this day. The title track from their Marquee Moon album combines the guitars of Verlaine and Richard Lloyd to create a powerful and intense sound that has the two competing to create the best solo possible. The song has been admired for its intense attention to detail.